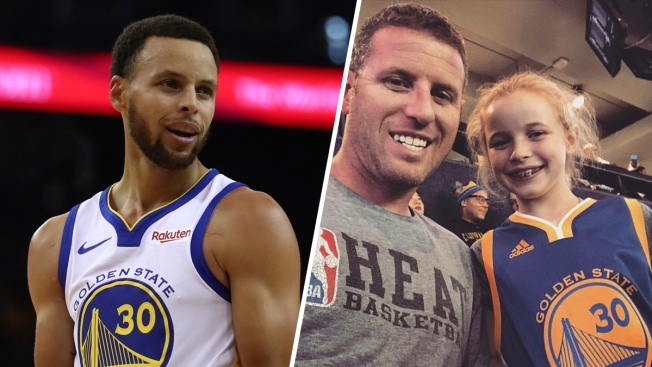 Chris Morrison posted a letter written by his daughter, Riley Morrison (R) to Twitter, asking Golden State Warriors point guard Stephen Curry (L) to work with Under Armour after she noticed that his Under Armour Icon Curry 5 sneakers weren't sold under the girls tab on the company's website while trying to buy a pair for her basketball season. Curry said he worked with Under Armour to put the shoes in the girls section. A 9-year-old girl wrote a note to NBA star Steph Curry pointing out that his namesake sneakers appeared to be available for sale only to boys, and not only did Curry respond, he made a change, NBC News reported. Riley Morrison wrote in her letter, which her father posted online on Nov. 18, that she's a big fan of the Golden State Warriors point guard, and in preparation for her basketball season wanted a pair of Under Armour Icon Curry 5 sneakers. But when she visited the website to buy them, she didn't see them listed under the girls' tab. “I know you support girl athletes because you have two daughters and you host an all-girls basketball camp," she wrote. Curry tweeted a handwritten note that he sent Morrison in response. "Unfortunately we have listed smaller sizes as 'boys' on the website," he acknowledged. He said he worked with Under Armour to put them in the girls section too. They're customizable and have instructions for women to order the sneakers one and a half size smaller than their usual size.